A must have in any radio collection, this 1946 post-War Truetone is in beautiful original condition. These radios were originally sold under the Truetone brand name in Western Auto stores. It has a beautiful large colorful dial and a new clear dial cover. The "Truetone" name is illuminated on the dial face when the radio is turned on. The ivory painted case is in original near mint condition, just a couple of tiny flea bites. It has its original metal back cover, knobs, and the original labels are on the bottom. The radio is playing very well, picking up all my local AM stations clearly. 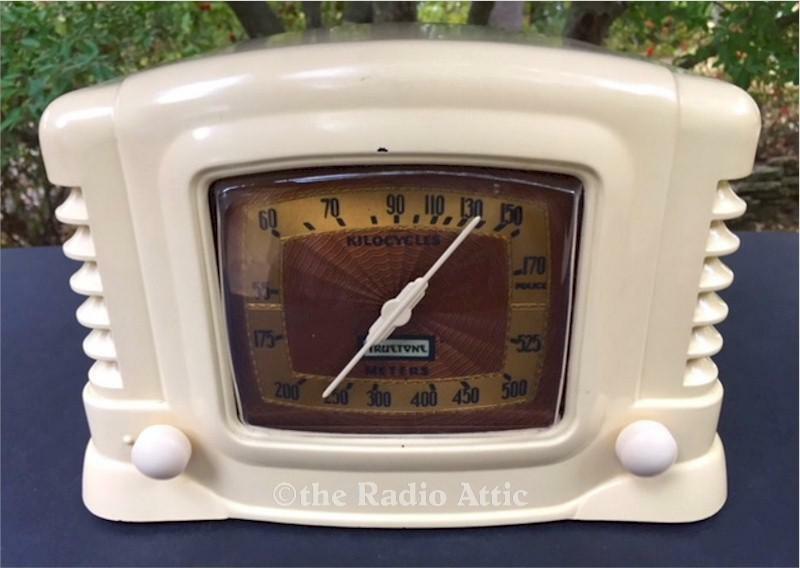 This radio exhibits a Deco design much earlier than its 1946 date. Almost midget sized at about 10-1/2"W x 6-1/2"H x 6"D.
You are visitor number 1,311 to this page.